Last autumn we decided to install solar panels on our home. We got bids from three solar companies, but SolarCity’s bid was so much lower than the others that I never even went back to the others to see if they could put in a competing bid. 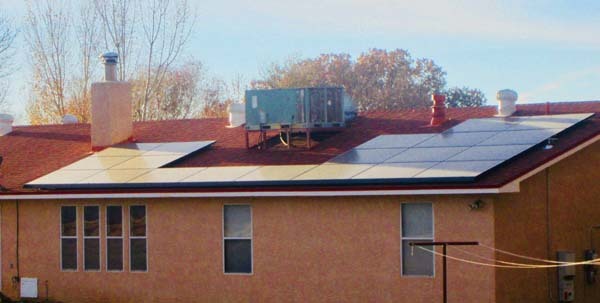 Installation was delayed because we needed to replace an old roof before putting solar panels on it, but SolarCity paid for the part off the roof their panels would sit on, so that helped. The roof installation was delayed by bad weather, and by the fact we had to get a crane to take the air conditioning unit off the roof while the installation went on. I was inclined to distrust the various mortgage schemes used to finance solar these days— if the house was sold, the new owner would have to assume the mortgage on the solar panels— and so we purchased the solar panels outright, and got a nice tax rebate from the government. The financial hit was softened somewhat when Tesla took over SolarCity, which caused such disorganization that four or five months went by before we were asked to pay for the work. No, we didn’t buy the PowerWall, the big storage power battery. It costs something like $6600 with all the hardware, and if we went off-grid we’d save only the $7.50 monthly hookup fee from PNM. Plus it’s only good for a few hours. Tesla tells me that in slightly less than 11 months we’ve saved over $1200, and conserved 6.9 tons of CO2. The system should pay for itself in 12-15 years. June is the hottest month here in New Mexico, and with the AC running during all daylight hours and most of the night, our electric bill last year was over $400. This year it was $75. So far, a good investment. Stay tuned. How much was the overall installation? And was that $325 (400-75) in a single month, a quarter, or ?? That $325 was for a single month. The cost of the installation is a rather complicated calculation, what with rebates and such, and I don’t have the figures at my fingertips. Not bad! In the coming ice age, you can use the power for heating, too, so it will work out well even when temperatures moderate.